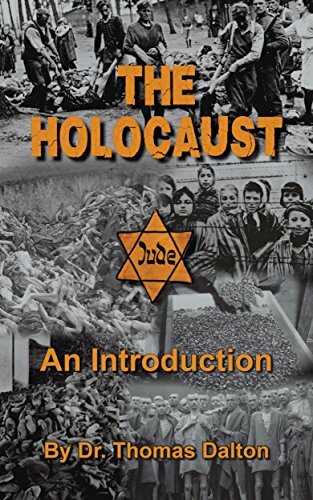 THE FULL TITLE IS THE HOLOCAUST: AN INTRODUCTION — EXPLORING THE EVIDENCE, which may mean it is the first of a series and there is at least one more coming. I didn’t ask about that because this slender paperback of 120 pages stands alone just fine. Some might say about this book: Do we need another introductory level revisionist book? Hasn’t it all been covered already? People who believe in the Holocaust don’t want to hear that there is no evidence for it. They point to photographs of piles of emaciated corpses (as on the book cover) taken at the time of ‘liberation’ at a few camps, believing that is representative of all the camps, which it is not. They don’t understand that those photographs are not evidence of the death of 6 million Jews. And 6 million is still widely insisted upon by the Jews themselves, with a separate number given to represent non-Jews. The early chapter “The Big Picture” asks how the 6 million number was determined. Breaking it down, Dalton concludes it amounts to killing an average of 3000 Jews per day, every day, from Sept. 1939 to May 1945. This is a gargantuan undertaking (not as much the killing as disposing of the bodies), while at the same time waging a war on two fronts against the world’s three major powers. No historian has ever adequately explained how this was done. Dalton’s second point is that people die all the time from natural causes and accidents. This is ignored when it comes to the Jews in Europe between 1933 and 1945. The natural rate between those years would have been 1.3 million Jewish deaths, but these are included as holocaust deaths. And thirdly, the 6 million number is never broken down as to how many died where, from what. The holocaust ‘experts’ are unable to provide that information so Dalton comes up with his own breakdown among “death camps”, other camps, ghettos, and shootings. Related to that, in a later chapter Dalton finds that a rule of thumb for the holocaust is that it exaggerates on the order of ten – that is, most accurate death totals are only around 10% of the official figures. So 6 million becomes 600,000 and 1.5 million at Auschwitz-Birkenau becomes 150,000. These are generous estimates from the revisionist point of view. But they do come to that when everything is worked out carefully and added up. It’s like the propagandists just multiplied the numbers by ten. In “The Mystery Deepens,” Dalton examines the German words Ausrottung, and it’s verb form Ausrotten, meaning to ‘root out’ or ‘uproot,’ the word often used by Hitler when speaking about removing the Jews from Germany. The word has been given the sole meaning of ‘exterminate,’ in the sense of ‘kill’ but there are other meanings, such as ‘eradicate,’ and to ‘totally remove.’ Another word Hitler and others used regarding the Jews was Vernichtung – the root word being nicht – nothing. The verb vernichten means ‘to bring to nothing’ or ‘deconstruct’, ‘unbuild’ something – although the historians translate it only as ‘to destroy.’ So Hitler’s program of ‘extermination’ becomes one of deportation. Dalton gives many examples of how these words were used. “The Run-up to the War” describes how the National-Socialists under Hitler’s leadership wanted, from 1923 on, to separate the Jews out from the Germans. When they came to power, they incrementally took rights and privileges away from Jews, encouraging them to emigrate, even allowing them to take most of their wealth with them. After what was intended by Hitler to be a local war with Poland ended in victory, Germany had gained 1.7 million more Jews. They now devised a plan to deport and confine all Germany’s Jews to reservations in this newly acquired territory they called the General Government. There was a longer-range plan to ship them further away, but this had to be postponed for the time being because the war had widened. The next chapter, “The Mechanism of Mass Murder,” is the longest one and is divided into Ghettos, Einsatzgruppen and Gas Chambers, figuring the number of deaths in each category. Gas Chambers is sub-sectioned into Majdanek, Chelmno, Belzec-Sobibor-Treblinka, and Auschwitz, the so-called ‘death’ camps. All the necessary details of each of these camps is discussed. Dalton comes up with the number of 570,000 Jewish holocaust-related deaths during the duration of World War II. Shocking? It fits the 10% rule. At the end of the book, the chapter “The Experts Respond” uses as examples two well-known holocaust historians who attack “deniers” but fail to discuss at all the issues Dalton brings up in this book – Richard Evans and Deborah Lipstadt. Evans was an expert witness for the defense in the Irving-Lipstadt trial, where he tore into David Irving calling him a liar. But Dalton’s criticism of Evans is that he refers only to the older generation of revisionists, completely ignoring the newer generation of Carlo Mattogno, Germar Rudolf, Juergen Graf, Thomas Kues, and a few more. Evans also resorts to ad hominem attacks, a distorted presentation of revisionism, and straw-man argumentation. The same goes for Lipstadt except that she is worse. Dalton says of her 12 points of alleged commonality amongst all deniers, only five are legitimate and relevant. He covers them all. The Holocaust: An Introduction is priced at 9.95. It contains a bibliography and an index of names. Because it is small and lightweight, it’s perfect to keep around, and even carry around, as a resource and “fact-book” for when you might get into a discussion about the topic. The information it contains is reliable and easy to locate. You can’t go wrong in purchasing this book. I think the main challenge is breaking down the omnipotent influence of mainstream media. For the large part we are still preaching to the converted. The newcomers are too few to make much of a difference. We have to 1) make impotent mainstream media and 2) become the news source alternative. This is happening. The process can be accelerated by every single penetrate realising that they have a job to do. This is best achieved by using their laptop as their newspaper office and sharing everything as widely as possible.